This beach community is only 20 minutes from Downtown San Diego, the Gaslamp District, Balboa Park and Mission Valley. 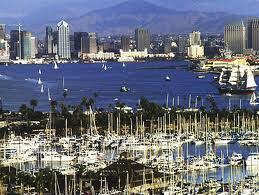 Point Loma and Point Loma Heights are full of residents who enjoy the seaside community life. With its rich history, beautiful landscape, incredible sunsets and so many housing options to choose from. Home prices range from $300,000 to several million depending on location, size and condition. Liberty Station, located in the heart of Point Loma, was originally a Naval Training Center site. The first recruits arrived in 1923 and San Diego military history was born. The first few buildings constructed on site included barracks, a mess hall, the dispensary, a fire station and the guards' quarters. During the World War II years of 1941-1945, the Naval Training Center continued to grow to accommodate the need for sailors. History states that in September of 1942, the population reached nearly 33,000, the most that the station would ever see. With San Diego being home to more than a sixth of the Navy's fleet, the Naval Training Center has played a key strategic role throughout the last century. The Point Loma Naval Base is still an active Military Base with submarines, a coast station and a weapons depot. Today Liberty Station is home to many residents of Point Loma. It's rich with shopping, entertainment, arts and culture, banking, parks and recreation, an abundance of dining options and beautiful homes and condos. With so many housing choices, there's bound to be one to fit your family's needs. One of the attractions in this beach community is the Cabrillo National Monument. When you drive up Cabrillo Memorial Drive on your way to the Monument, you'll pass the Fort Rosecrans Military Reserve and National Cemetery. This awe-inspiring cemetery is lined with perfect rows of grave markers commemorating our soldiers lost in battle. Since the Cabrillo Monument is situated at the top of the hill, it's certainly worth the drive to see the most spectacular views of San Diego Bay, Downtown San Diego and the beautiful Coronado Bay Bridge. There is also a platform near the Monument which makes it easy to view the winter whale migration typically happening from November to March. If you're lucky, you'll see gray whales pass by in route to their breeding grounds off Baja, California, Mexico. This has always been an incredible site to see and visitors come from all over. Whether you are a resident of Point Loma or you are a visitor to this seaside community, you'll be glad you were here.